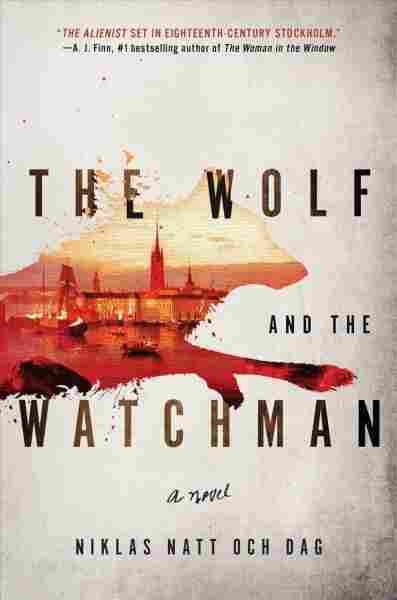 The Wolf and the Watchman NPR coverage of The Wolf and the Watchman by Niklas Natt Och Dag. News, author interviews, critics' picks and more. March 6, 2019  Niklas Natt och Dag's new novel is both ornate period piece — set in the grit and grime of late-18th-century Stockholm — and riveting murder mystery starring a mismatched pair of proto-gumshoes. As an agitated shaking rouses Cardell from his slumber, he feels a fleeting ache in the left arm he no longer owns. A carved wooden arm has taken the place of the missing limb. His stump rests in a hollow space inside the beechwood, attached at the elbow with the aid of leather straps. They are cutting into his flesh. He should know better by now and have loosened them before nodding off. Reluctantly, he opens his eyes and stares out across the vast plain of the stained table. When he makes an attempt to lift his head, his cheek sticks to the wooden surface and he inadvertently pulls his wig off as he stands up. He curses and uses it to wipe his brow before tucking it inside his jacket. His hat rolls down onto the floor, its crown dented. He punches it out and then pulls it onto his head. His memory is beginning to return. He is at Cellar Hamburg and must have drunk himself senseless. A glance over his shoulder reveals others in a similar condition. The few drunks that the proprietor considered affluent enough not to toss into the gutter are sprawled over benches and across tables, until the morning, when they will stagger away to receive the reproaches of those waiting at home. Not so for Cardell. A crippled war veteran, he lives alone and his time is no one’s but his own. The two youngsters who have roused him are guttersnipes. Their faces look familiar but he is unable to recall their names. Behind them stands the Ram, the well-nourished manager who works for Widow Norström, the owner. The Ram is groggy and flushed and has positioned himself between the children and a collection of etched glass: the pride of the cellar, stored behind lock and key in a blue cabinet. The condemned stop here at Cellar Hamburg on their way to the Sconce Tollgate and to the gallows beyond. At the steps of the Hamburg they are served their last drink, after which the glass is carefully retrieved, etched with name and date, and added to the collection. The patrons may drink from one of these only under supervision and upon payment of a fee based on the degree of infamy of the condemned. It is said to bring good fortune. Cardell has never understood the reasoning. Cardell rubs his eyes and realizes he is still inebriated. His voice is thick when he tries it. It is the older one—a girl—who answers. The boy is harelipped, and her brother, to judge by his features. He wrinkles his nose at Cardell’s breath and takes cover behind his sister. Her tone is a blend of terror and excitement. The veins in Cardell’s forehead feel close to bursting. The pounding of his heart threatens to drown out what feeble thoughts he tries to muster. He rubs his temples in a vain hope of easing the throbbing pain. Above the Southern Isle, the skies have not yet begun to lighten. Cardell staggers out and down the steps of the Hamburg and follows the children along the empty street, halfheartedly listening to a story about a thirsty cow that reared up at the water’s edge and took off in terror in the direction of Danto. Underfoot the stones give way to mud as they get closer to the lake. Cardell’s duties have not carried him past the shores of the Larder in a long time, but he sees that nothing has changed. Nothing has come of the long-held plans to clean the shoreline and build a quay with piers, though this is hardly any cause of wonder when both city and state teeter on the brink of ruin. The fine houses around the lake have long since been repurposed into manufactories. The workshops throw their waste directly into the water, and the fenced section intended for human waste is overflowing and ignored by most. Cardell lets out a colorful phrase when his bootheel ploughs a furrow in the muck and he has to flap his healthy arm to maintain his balance. The waves lap against the shore, churning up a pale yellow froth. Something rotten—a dark lump—is floating a few meters out. Cardell’s first thought is that it cannot possibly be a human being. It is too small. The girl insists she is not mistaken. The boy nods in agreement. Cardell snorts in surrender. He works his way out of his coat with the awkwardness of the one-handed. The forgotten woollen wig falls out of the lining, into the slush. Never mind. The miserable thing only cost a pittance and the fashion is on its way out. He wears it only because a more proper appearance improves the chances that someone will stand a war veteran a drink or two. Cardell casts a glance at the sky. High above, a band of distant stars shine over Årsta Bay. He closes his eyes to seal the impression of beauty inside him and steps into the lake, right leg first. The boggy edge doesn’t support his weight. He sinks down as far as his knee and feels the lake water pouring over the edge of his boot, which remains stuck in the sludge as his involuntary fall forwards pulls his leg along. With something between a crawl and a doggy-paddle, he begins to make his way farther out. The water is thick between his fingers, full of things that even the residents of the Southern Isle don’t consider worth keeping. His intoxication has impaired his sense of judgment. He feels a stab of panic when he no longer has the lake bottom under his feet. This water is deeper than anticipated and he finds himself back at Svensksund three years ago, terrified and tossed by the waves, with the Swedish front drawing back. He grasps the body in the water once his kicking has carried him close enough. His first thought is that he was correct. This cannot be a human being. It is a discarded carcass, tossed here by the butcher’s boys, made into a buoy as the gases of decomposition expand its innards. Then the lump rolls over and shows him its face. It isn’t rotten at all, and yet empty eye sockets stare back at him. Behind the torn lips there are no teeth. The hair alone has retained its luster—the night and the lake have done their best to dim its color, but it is without a doubt a mass of light blond hair. Cardell’s sudden intake of breath fills his mouth with water and causes him to choke. When his coughing fit has subsided, he floats motionless next to the corpse, studying its ravaged features. Back on the shore, the children make no sound. They await his return in silence. He grabs the body, turns around in the water, and starts to kick with his bare foot to make his way back towards land. The recovery effort becomes more laborious when he reaches the muddy embankment and the water no longer carries their weight. Cardell rolls over onto his back and kicks his way up with both legs, dragging his quarry by its ragged covering. The children do not help him. Instead, they back away cowering, holding their noses. Cardell clears his throat of the filthy pond water and spits into the mud. The children make no move to comply, as eager to keep their distance as they are to get a glimpse of Cardell’s catch. Only when he tosses a handful of muck at them do they set off. When their small feet are out of earshot, he leans over to the side and vomits. Stillness descends, and in his isolation, Cardell feels a cold embrace pressing all air out of his lungs, making it impossible to draw the next breath. His heart beats faster and faster, the blood throbs in the veins in his throat, and he is overcome with a paralyzing fear. He knows all too well what comes next. He feels the arm that is no longer his solidify out of the surrounding darkness until every part of his being tells him it is back where it once was, and with it a pain searing enough to cancel the world itself out, as a jaw with teeth of iron gnaws flesh, bone, and gristle. In a state of panic, he tears at the leather straps and lets the wooden arm fall into the mud. He grabs his stump with his right hand and massages the scarred flesh to force his senses to accept that the arm they perceive no longer exists and that the wound is long since healed. The seizure lasts no more than a minute. Breath returns, first in shallow gasps and then in calmer, slower inhalations. The terror subsides and the world regains its familiar contours. These sudden panic attacks have plagued him for the past three years, ever since he returned from the war, one arm and one friend poorer. And yet that was all a long time ago now. He thought he had found a method to keep the nightmares at bay. Strong drink and bar brawls. Cardell looks around, as if for something to soothe himself with, but he and the corpse are alone. He sways side to side holding his stump in a firm grasp.